A key figure in Morsi's government has called the Holocaust a hoax cooked up by U.S. intelligence operatives. A key figure in Egyptian President Mohammed Morsi's government has called the Holocaust a hoax cooked up by U.S. intelligence operatives, and claimed the six million Jews who were killed by Nazis simply moved to the U.S., Fox News reports. The claims made by Fathi Shihab-Eddim, a senior figure close to President Morsi who is now responsible for appointing the editors of all state-run Egyptian newspapers, came as the world marked Holocaust Remembrance Day on January 27. “The myth of the Holocaust is an industry that America invented,” Shihab-Eddim said, according to Fox News. “U.S. intelligence agencies in cooperation with their counterparts in allied nations during World War II created it [the Holocaust] to destroy the image of their opponents in Germany, and to justify war and massive destruction against military and civilian facilities of the Axis powers, and especially to hit Hiroshima and Nagasaki with the atomic bomb,” Shihab-Eddim added. Daniel Greenfield, a Shillman Journalism Fellow at the Freedom Center in New York, said Shihab-Eddin's comments were as troubling as they were ridiculous. “Fathi goes on to claim that the six million Jews all really moved to the United States during the war (and oddly no one noticed) and that the number of Jews killed in the war was about the number who died in traffic accidents,” Greenfield wrote in Frontpagemag.com. Efraim Zuroff, Israel Director of the Jerusalem-based Simon Weisenthal Center told Fox News the remarks show a dangerous, but common, mindset. Zuroff said the sinister statements by the Morsi aide should give other nations pause for thought in evaluating their relationships with the new government in Cairo. The latest Holocaust denial from a senior Egyptian figure comes hot on the heels of the much-publicized comments made by Morsi in 2010, that Jews are “the descendants of apes and pigs.” The remarks were exposed in a video distributed by the Middle East Media Research Institute (MEMRI). 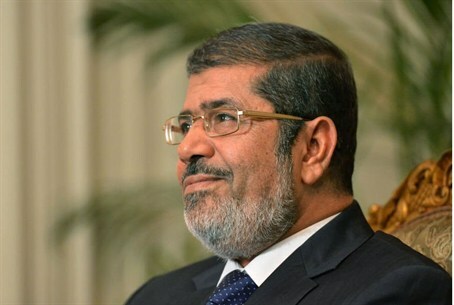 Morsi later claimed that his virulent anti-Semitic comments were taken out of context. "The president stressed they were taken from comments on the Israeli aggression against Palestinians in the Gaza Strip, and stressed the need to put the remarks in the right context," said a statement from Morsi’s office. MEMRI has since released another video in which Morsi is seen calling for Arabs to raise their children on hatred of Jews. Mohammed el-Baradei, a leading figure in Egypt’s secular opposition and formerly the director general of the International Atomic Energy Agency, spoke out against Morsi’s remarks and his assertion that his comments had been misinterpreted. “We are all aware that those statements were not taken out of context and that this discourse is very common among a large number of clerics and members of Islamist groups," El-Baradei said, according to Fox News. "Apart from the remarks themselves, I am calling upon the person who made them to courageously admit either the real stance he and the Muslim Brotherhood and their followers adopt, or how mistaken they had been for all those years,” he added.